of hobby-horsing, but newcomers will enjoy this book as much as old friends of the series. The book gives detailed instructions of how to make these pet ponies out of recycled materials available at home, not forgetting rosettes, blankets and other essentials. Building a stable or a riding court is easy-peasy with this guide. 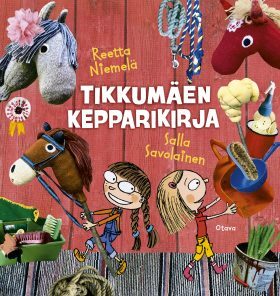 The non-fiction book is packed with activities and facts about horses and lots of fun tips to make the most of hobby horses. The collage style of photographs and drawings is creative and encouraging. This is the sixth book in the Star Hill Stables series, which has been translated into eight languages.